Agriculture and Natural Resources Educator Sam Custer spoke at the Cattlemen’s Association’s annual banquet Monday night. 2018 Cattlemen’s Queen Katie Wilcox and Versailles senior Kimberly Winner were presented scholarships at Monday night’s banquet. 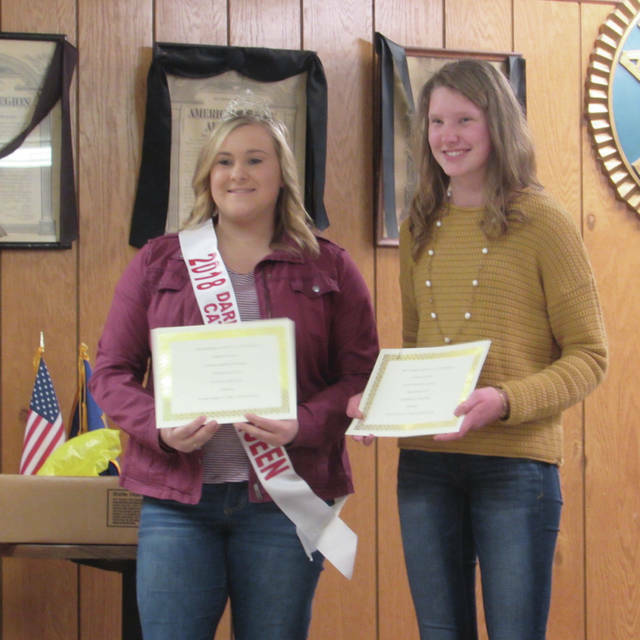 Herdsman Awards were presented to 2019 Cattlemen’s Queen Jenna Godown and Paige Gehret at Monday night’s banquet. 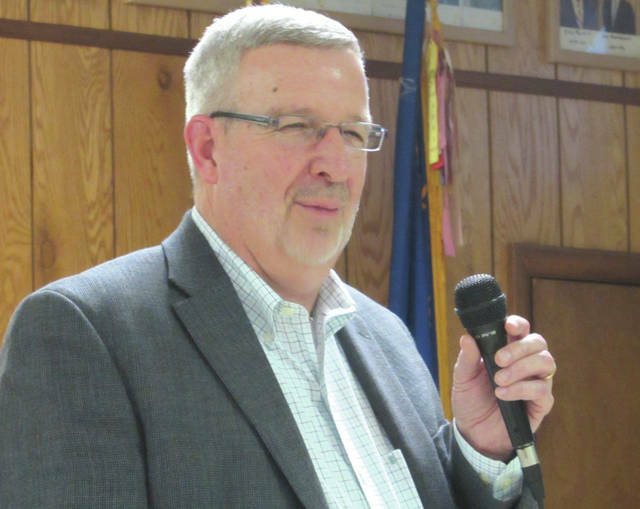 GREENVILLE — Agriculture and Natural Resources Educator Sam Custer spoke at the Darke County Cattlemen’s Association’s annual banquet Monday night. Custer, who works for Ohio State University’s Darke County Extension Office, stressed the importance of adapting to widespread changes in the industry, saying that many large companies will soon begin refusing to purchase product from sellers who do not hold a Beef Quality Assurance certification. According to the organization’s website, BQA is a nationally coordinated, state-implemented program that provides information to beef producers and consumers on how husbandry techniques can be coupled with accepted scientific knowledge to raise cattle under optimum management and environmental conditions. The certification can be acquired online and is tailored to those in a number of specific roles within the industry, including cow-calf producers, stockers, feedyard operators and dairy producers. “Today’s society wants a wholesome product that is safe, and we need to assure them that’s what we’re providing,” Custer said. Modern consumers have wider-reaching concerns than those of 30 or 40 years ago, according to Custer. Oft-cited consumer concerns, according to Custer, include the threat of bacterial contamination, harmful residue from pesticides, product tampering, use of hormones to promote livestock growth and the way beef is handled in supermarkets. The right quality assurance practices, however, could help farmers alleviate these concerns. “This is going to help us make sure we’re doing the right things when growing the beef we want to put on the table for our neighbors, our consumers and ourselves,” Custer said. Custer also pushed the importance of viewing manure as a resource rather than a waste product, saying the substance is a source of nutrients that can aid in corn production. Custer specifically valued liquid manure at approximately $30 per 1,000 gallons. “That’s up to $300 in nutrients you don’t have to pay someone else for,” Custer said. 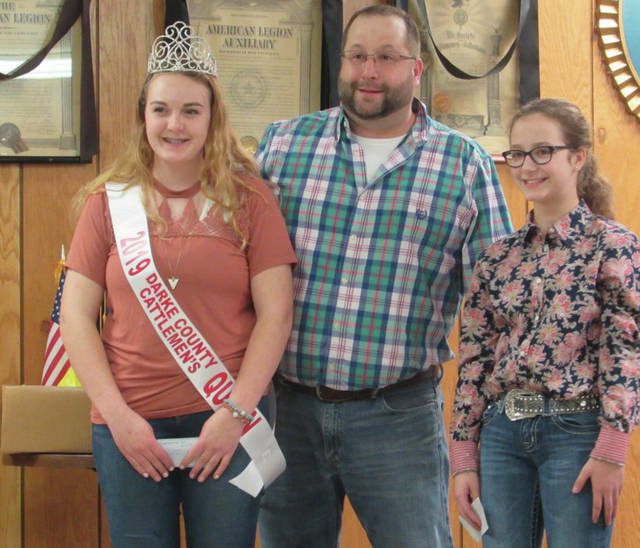 The event also featured the crowning of this year’s Darke County Cattlemen’s Queen, Jenna Godown. The 2018 queen, Katie Wilcox, and Versailles High School senior Kimberly Winner, meanwhile, were presented scholarships to the University of Northwestern Ohio and Wright State University’s Lake Campus, respectively. Herdsman Awards were presented to Jenna Godown and Paige Gehret in recognition of their 4H and FFA achievements over the past year. Finally, a representative from U.S. Rep. Warren Davidson’s office spoke briefly, saying that feedback from attendees at last year’s banquet was instrumental in helping prevent the passage of a law that would’ve placed emission restrictions on livestock kept in covered facilities. This entry was tagged Cattle, Darke County Cattlemen’s Association, Darke County Extension Office. Bookmark the permalink.